Founded in 2012, Tentacle Tribe is the brainchild of Emmaneulle Lê Phan and Elon Höglund. Combining street and club dance with an experimental modern sensibility, Tentacle Tribe is guaranteed to bend your mind at least as much as they bend their bodies. I had the great pleasure of talking with Emmanuelle and Elon about their upcoming Danse Danse show. Be sure to bring a little extra cash for their über-cool tentacle t-shirts! Nancy Berman (NB): Tell me about your approach to dance and choreography. Emmanuelle Lê Phan (EP): I have two different approaches that complement each other. I studied contemporary dance at Concordia but at night I danced at clubs and I’ve also done a lot of street dancing. Break dancing and modern dance have some parallels; I don’t discriminate, I want learn to learn as many different ways of moving as possible. Elon Höglund (EH): I always try to do something outside the box. I combine different styles in order ultimately to have freedom. I use the technique to go beyond the technique, to gain body awareness. We both have different ways of seeing things but in the end we get the same product. As a creator, when you talk about dancing you can only create what you feel. You can only do you. You can think about us as musicians, and the body is our musical instrument. Some people use their instruments by learning technique but in the end we try to get away from that and it’s all dance. We work a lot on being organic. The body moves how it’s intended to move, although some of the movements aren’t natural at all. Still, you can do them so that they become natural. NB: How did you two meet? EH: We met in rehearsals for Cirque du Soleil’s show Love. It was the first time Cirque du Soleil used more experimental modern dance. NB: Tell me about the piece Nobody Likes a Pixelated Squid. EH: I could tell you a lot of things about it but at the same time but we don’t want to tell you what the story is. I don’t want to say too much. It’s our first longer piece as Tentacle Tribe. We’d like to make into a full-length piece. We’ve kept it simple, not adding too many props and technical aspects, just dancing and music and lights. We have a story we are telling that we are aware of but there are many subtexts. We tell a story with the movement but it’s also very much about dancing. EP: We tried to push our style. Elon was inspired by fractals, finding geometry in space and in our bodies. The choreography involves a lot of extremely precise and intricately complex partnering. We pushed our style to the maximum in order to deliver beautiful movement. EH: There are many deeper meanings, including the idea that you can experience different things differently, that there is the possibility of every choice you make creating different choices. Like in particle science—breaking things down to find the essence of life. We were inspired by that idea, by deconstructing movement. NB: What’s with the tentacle/sea creature imagery? EH: We were looking for an animal to represent us. We like the visual but we also like the squid’s ability to adapt to situations, to change its form. It’s spineless: its body can bend in any way. It represents flexibility and movement and adaptability. 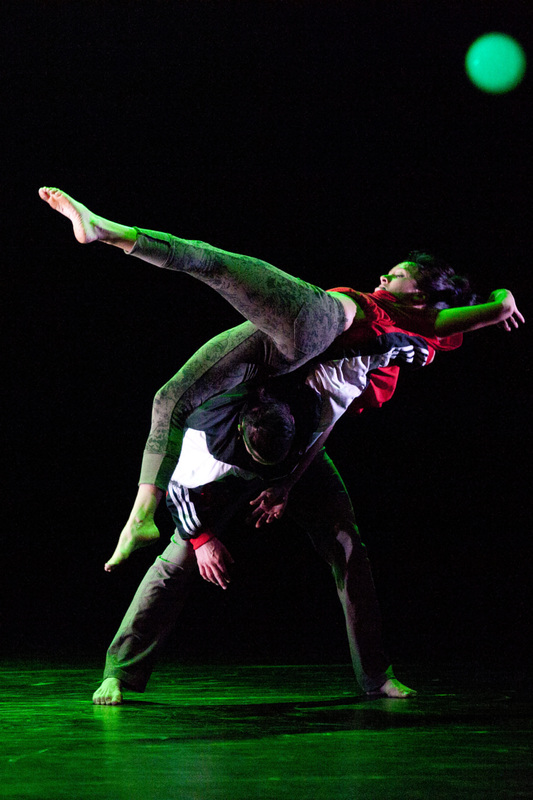 We came from street dance and have to be able to adapt and function in the theatre world. Also the suction cups—we use our whole body as if we had them all over. We move like we’re in water, like jellyfish. Animals in general have a connectedness we aspire to. We want to be more present, like an animal, and communicate telepathically, like birds flying together. If I could hope for something, it would be that we could transfer to people how we feel about dancing, and that maybe then people would try to do things that make them feel good. To love a little bit more and hate a little bit less. Tentacle Tribe performs with Wants&Needs Danse at Cinqième Salle at Place des Arts (260 Maisonneuve W) on October 21, 22, 23, 24, 25. 8pm. Sold out.